One very cool thing about having a son is that I get to play with all the toys that I used to covet when I was a youngster. And unlike the grown-up toy geeks who just look creepy buying up all the Target exclusive Star Wars playsets when they come out, I can roll down the aisle, head held high, looking like a normal well-adjusted adult while I fill my cart full of action figure euphoria because I am getting them for my son (just ignore the spittle forming around the sides of my mouth as I explain in detail to Fury the subtle differences between the new Hoth Snowspeeder and the original Kenner version of my youth). (From next room) "Hey, Fury. That Star Destroyer still in one piece?" "Yup... *crack* I mean two...*crack* I mean three..."
I also remember the time he really impressed me with his creativity. "Wow, Fury! Did you make this yourself?" "Nah, I broke it myself." I don't know about you, but when I was a kid, action figure scenarios were all about good vs. evil. I guess today's kids subscribe to kinder, gentler, Spring breakier fantasies. "Look, dad! It's the Star Wars Party Truck!" "This is where the secret cave entrance is, and here is where you hide the treasure. And the cannons are right here to protect the fort. And in the back here... is the conference room." Because it is imperative that today's pirate know his "Three P's" - Plundering, Pillaging and PowerPoint. Today's superhero is one part Bionicle, one part Spiderman, one part Ben 10, one part Superman, one part Darth Vader, one part Yoda, one part The Children's Place, one part Nacho Libre and ten parts awesome. When I was a kid, I remember playing with Tonka trucks and Matchbox cars in the same scenario, despite the fact that they weren't to equivalent scale (being able to pile 10 sedans into the bed of a single pickup truck kind of clues you in on that). When did kids get all up in arms about compatibility? I blame Windows Vista. "Fury, how's this for a cool motorcycle!" "Dad, you can't do that. 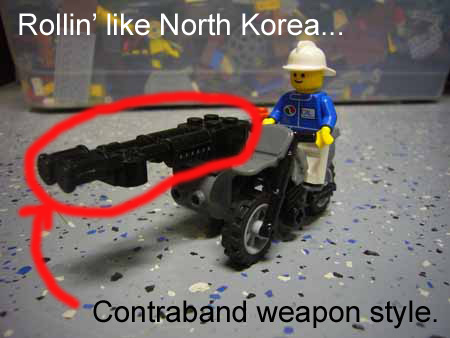 You mixed a Mega Bloks gun with a Lego motorcycle!" "Dad, you would go to jail for that. Well, in some states. You're lucky California is a free state." 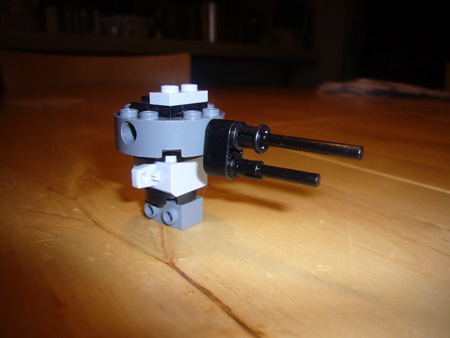 "Dad, this Bionicle has a throwing knife, thundersword, shark knife, superswords, small and large claws, energy sword, thunderblade, spinning blade, spinning hook, swinging glass breaker, energy shooter, super zapper, strike claw, 3-handled razor-sharp knife, stickblade, crab blasters, infected masks, canyon crusher, ice wall crusher, superbomb, machine blaster, pickup and drop, remake life power, lasers, poison out of their mouth, ultrakick, superkick... and he's a really good dancer." It must be nice to know that you have a fallback career in case saving Mata Nui from the clutches of the evil Makuta doesn't really pan out. Now you know why we've got a playroom that used to be a garage, stacked floor-to-ceiling with toys. They inspire me to write, while doing less damage to my liver.